We present our Key Chained To Globe Business PowerPoint Templates And PowerPoint Themes 1112.Use our Security PowerPoint Templates because,You have the right arrows in your quiver. Use our Success PowerPoint Templates because,If making a mark is your obsession,. Use our Business PowerPoint Templates because,are the tools that helped most of us evolve. 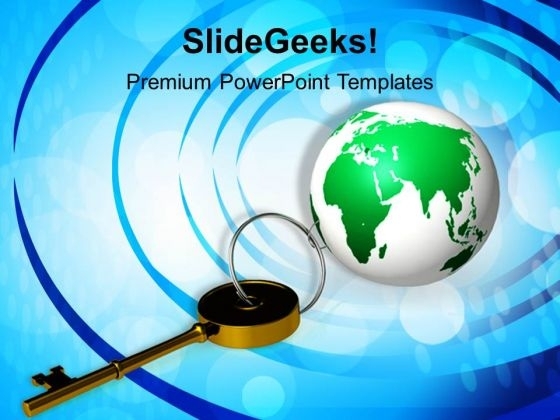 Use our Globe PowerPoint Templates because, There are a bucketful of brilliant ideas swirling around within your group. Use our Spheres PowerPoint Templates because,The basic stages are in place, you need to build upon them with our PowerPoint templates.Use these PowerPoint slides for presentations relating to "Globe and key chain, security, success, business, globe, spheres". The prominent colors used in the PowerPoint template are Green, White, Black Our Key Chained To Globe Business PowerPoint Templates And PowerPoint Themes 1112 are fairly broadbased. They give you ample scope to address your mind. Feel like a celebrity with our Key Chained To Globe Business PowerPoint Templates And PowerPoint Themes 1112. They ensure ample adulation.